Many, many moons ago, a very handsome man, with an impressive beard, sat on the steps of the River Walk along the Detroit River and asked to spend the rest of his life with me. After gleefully consenting, a gorgeous two-tone engagement ring was slipped onto my finger. I have worn this ring every day since then. Every time I look at it, I smile. I remember fondly the care that went into designing it, the dedication in purchasing it, and the love that made it all worth it. I still get butterflies looking at my engagement ring, now snugly nestled against a one-of-a-kind wedding band. But I understand that my experience isn’t shared by every married woman. Some women didn’t have much say in what their engagement ring looks like (I was fortunate that I was working in our downtown Brighton showroom at that time, so I had immediate access to one of the greatest minds in jewelry design). Some women have been married for decades and wear rings that are no longer in style. Or what about the women who have beautiful wedding sets, but their lifestyle just isn’t suited to wearing it regularly? Fortunately, a less-than-ideal setting doesn’t have to be the end of your wedding ring’s story. By embracing the power of custom design, you can rewrite your love story…well, at least, the symbol of your love story. The thought of having a wedding set re-designed can be overwhelming; I get it. But it doesn’t have to be. There are some simple things you can do before sitting down with our designer. And while things inevitably change through the course of your consultation (our designer is going to present ideas that you haven’t considered), you will have a pretty good idea of what to expect. 1. Will you be reusing your diamonds? Traditional engagement rings feature a larger-than-the-rest center stone. 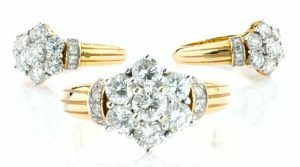 As a result, the center stone is generally the single most expensive part of a wedding set. Reusing your center stone can be a great way to reduce some of the cost of remaking your wedding set. But the center stone is only one stone in a wedding set. And unless you are going for a solitaire look, you might want to reuse some of your side stones as well. 2. 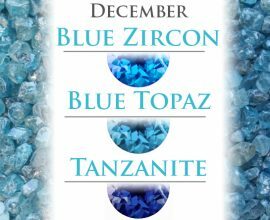 If you won’t be reusing your center stone, what kind of diamond do you want? Ladies who got married in the ‘80s are likely sporting a marquis center stone, while ‘90s brides probably have a princess (square) cut diamond. Right now, oval cuts, pear shapes, and cushion cuts are having their moments in the sun. If you want to modernize your center stone, you’ll need to give some thought to the shape you want. You should also take into consideration that the less popular shapes are frequently slightly less expensive than their popular friends. And in case you were wondering, round brilliant cuts are always well-liked and will retain their popularity status (at least, I assume so. Round brilliants have been perennially popular; I can’t imagine it will stop anytime soon). 3. What do you like about your existing ring and what do you wish was different? 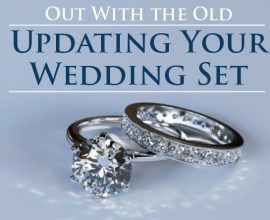 The redesign process is the perfect time to make adjustments to your wedding set. There are things you know now that probably weren’t even on your radar when you got married. Maybe you scratched your first baby’s cheek with a prong, and you want to make sure that isn’t going to happen to any nieces, nephews, or grandbabies you’ll be holding in the future. 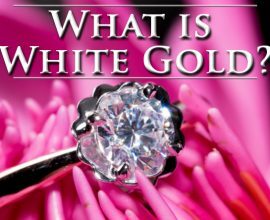 Maybe you adored white gold when you got married, but as you have gotten older, your tastes have evolved and now you want a yellow or multi-tone gold ring. That’s okay! Just jot down some notes about what you definitely want to change and what you definitely want to retain. And if you have pictures, bring those along too. 4. What kind of style are you attracted to? 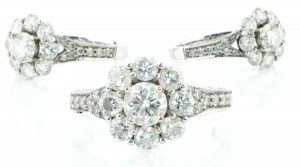 As your tastes have changed and the years of fashion and style have elapsed, your ring’s style may feel a little outdated. So if you are planning a complete overhaul, give some thought to what kind of style you want to showcase on your finger going forward. Because trends shift, keep in mind that choosing something ultra-trendy may not be the best strategy…lest you find yourself in this same situation sooner than you would care to. The best thing to do is find some pictures of styles that inspire you or make your pulse quicken. You can print them from online, cut them out of magazines, or even draw them on a scrap piece of paper. When you come meet with our designer, he can help focus your goal style. He can help you achieve balance between what it is in style and what fits your style. 5. Is there any special meaning you would like to incorporate? If you are redesigning a wedding set, I’m going to assume you have been married for a while and have a bunch of great memories and stories rolled into that marriage. Will you be incorporating anything into the ring to commemorate anything? Will you want anything engraved on the ring? Will you want to include any colored stones to represent your kids? Will you want to use family or heirloom diamonds? If you will be using stones that aren’t currently part of your wedding set, make sure you bring them in. Our designer will need to take measurements so he knows how to best fit the stones and set them in the design. Diamonds are not a one-size-fits-all kind of thing. Each stone has a unique personality, cut, and proportion. I know these questions can even feel overwhelming. But don’t let these queries get to you. They are just simple things to get your thoughts percolating. If you already have an idea about these issues, you are setting yourself up for a productive and enjoyable custom design experience. If you think it’s time to upgrade or update your wedding set, bring your rings and your spouse down to our showroom and let’s get to work.